I’m pretty zealous about keeping games in mint condition, and even my copies are pretty battered. I had a bad habit of playing them, for one thing. And I wasn’t the only one — these games tended to get passed around. 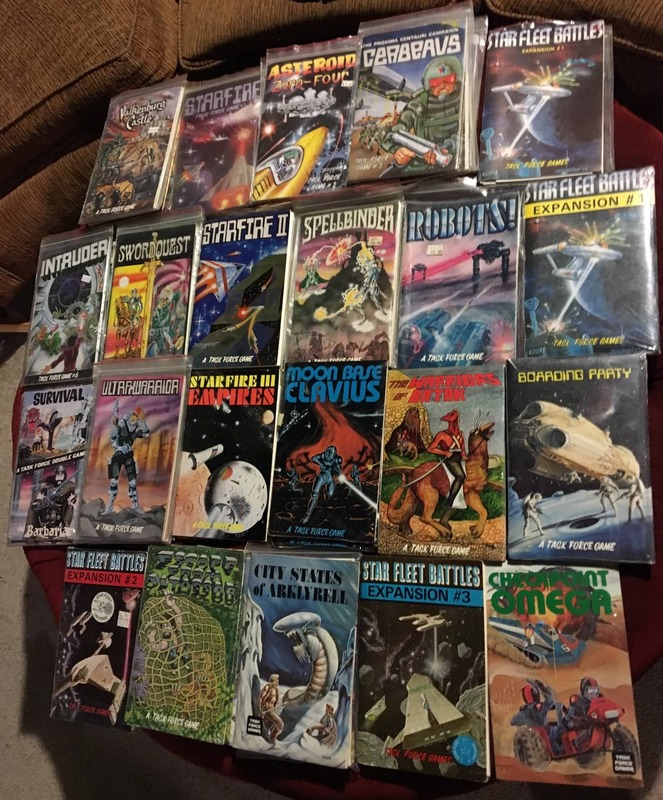 I still remember finding a nearly demolished copy of Star Smuggler at the bottom of my brother Mike’s gym bag. He’d taken it to his job as a night security guard at NRC in Ottawa, and played the game literally to pieces. 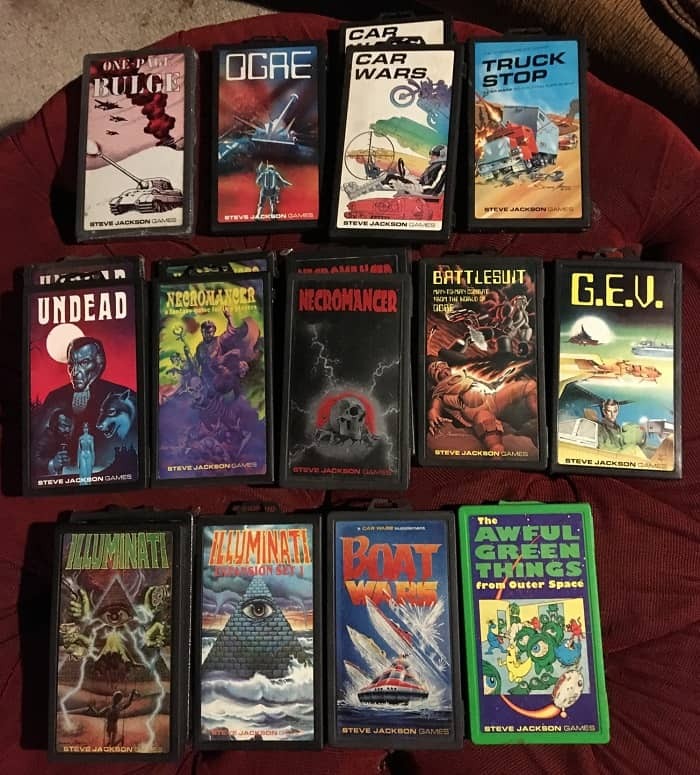 I’ve been hunting for replacement copies of some of these games for decades without much luck. If you’ve shopped for these games online in recent years, you know what I’m talking about. Good condition copies sell for $50-80 and up, and those in high demand — like Dragon Rage and Barbarian Prince — can sell for well over $100. If you’re curious about microgames, chasing after a diminishing number of fragile Dwarfstar titles probably isn’t the best way to start collecting. You might want to start with some of the top-selling games that are a little more obtainable — and still interesting for all that. For example, the game that launched the genre was Ogre, designed by Steve Jackson and published by Metagaming in 1977. 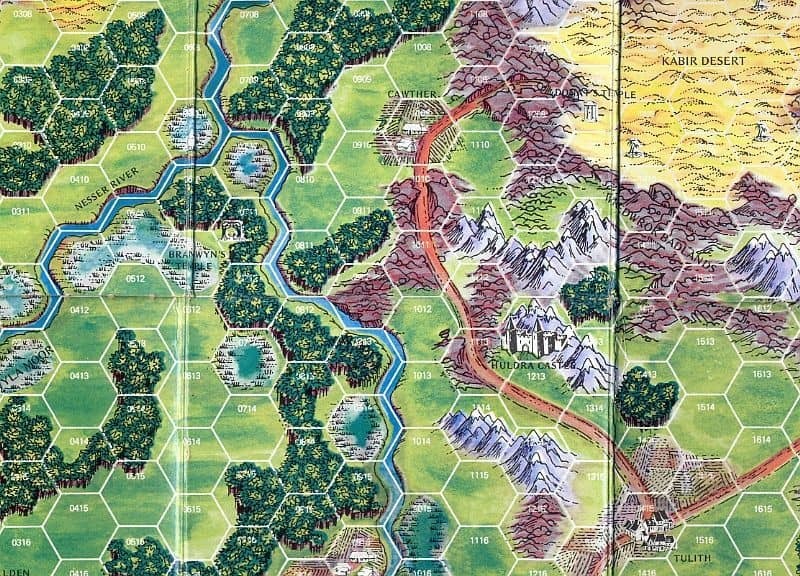 Jackson was a true innovator, and in a time when the industry was moving towards monster games like SPI’s Atlantic Wall and Chaosium’s Dragon Pass, he defied conventional wisdom to prove that a game with a very simple map, short rules, and quick playing time could be enormously popular. I’m told Ogre sold over 100,000 copies in its microgame format, and it’s been reprinted countless times since (including the monster $100 Ogre Designer’s Edition, funded by a Kickstarter that raised nearly a million dollars). Jackson has innovated many times in his career. One of the innovations I don’t think he gets enough credit for was taking the next logical step for microgames — producing them in a more durable format. When he split from Metagaming in 1980 to found Steve Jackson Games (taking Ogre and G.E.V. with him), he immediately began publishing microgames of his own, packaged in sturdy cases that could be jammed into your back pocket with minimal wear and tear on the components. As a result, Jackson’s line of top-notch microgames has survived well, and if you’re interested in dabbling in collecting, it’s a great place to start. 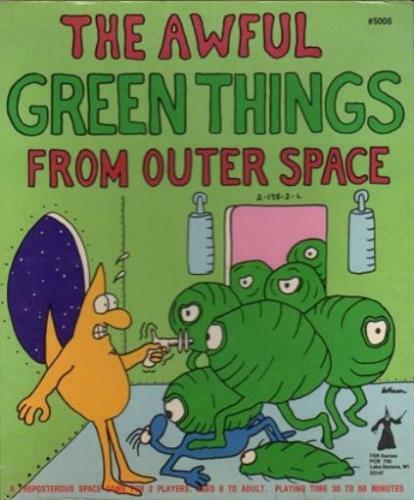 I especially recommend Ogre, Car Wars, Undead, and Tom Wham’s The Awful Green Things From Outer Space. Minigames were a huge part of my early experience with science fiction. I carried copies of Metagaming’s Ogre and Melee to school for years, and played them with my friends over lunch. 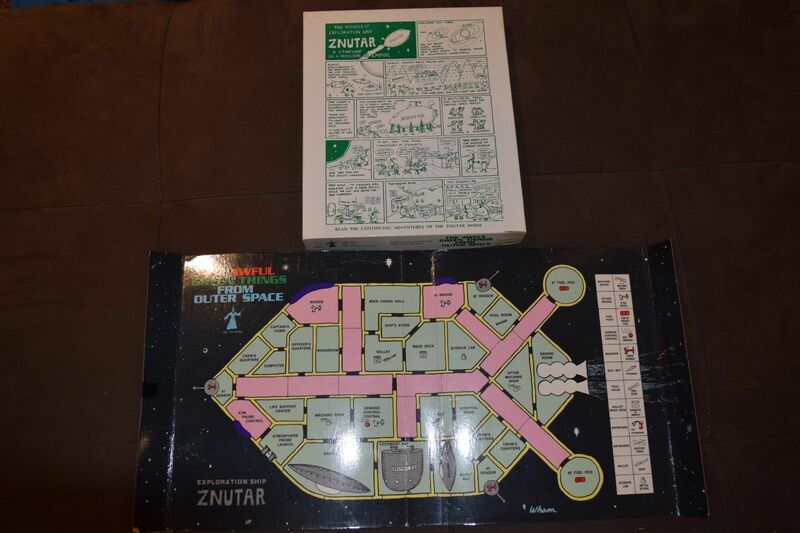 My classmates had Star Fleet Battles and Starfire stuffed in their backpacks, and it wasn’t unusual to see people playing them in the halls at the first science fiction conventions I attended. They were cheap, fast-playing, easy to learn — and most importantly, popular. 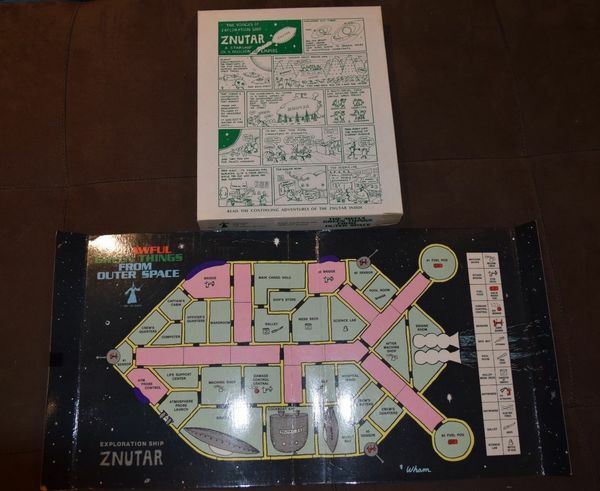 It’s weird to think of science fiction board gaming as a portable and social hobby, but 35 years ago that was the truth. These days computer gaming has almost completely filled that market niche, and science fiction minigames are mostly items of nostalgia. But so many copies were produced that they are still in circulation, and the more popular titles are still played today. 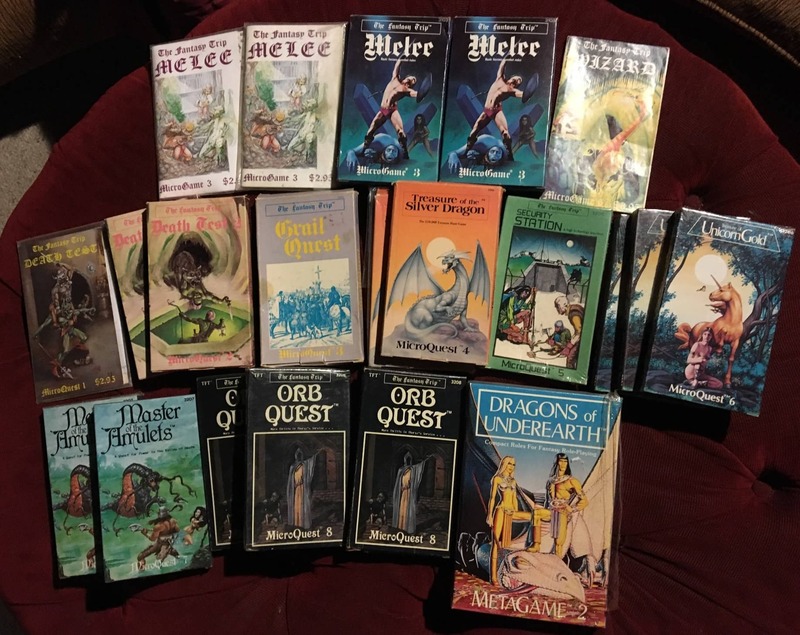 Undoubtedly the ones I still pull out most often are by Metagaming, especially their proto-RPG games Melee and Wizard, also designed by Steve Jackson. My other favorite Metagaming titles include Chitin I: The Harvest Wars, Howard Thompson’s ambitious and imaginative wargame on an alien planet; Rivets, a war between robot factories, and The Lords of Underearth, which re-created the fall of Moria in Lord of the Rings. 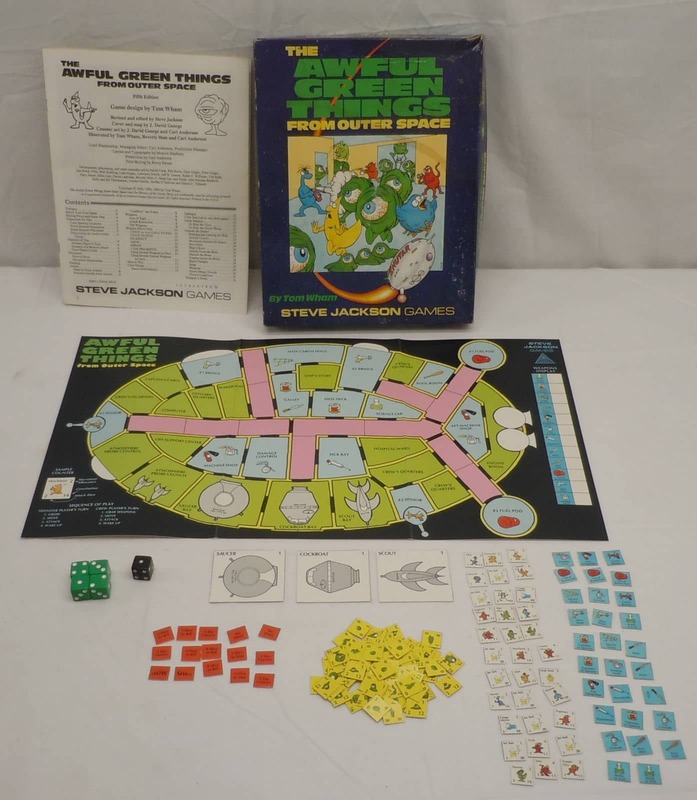 But the game that kept me coming back year after year was Steve Jackson’s The Fantasy Trip, published in pieces as Melee (1977), Wizard (1978), and especially the delightful line of solitaire programed adventures that went with it, including Death Test, Death Test 2 (1980), and the Arthurian-themed Grail Quest (1980). These were the games that introduced me to role playing 40 years ago, and when my kids were old enough to roll dice without trying to eat them first, the first games I taught them to play were Melee and Wizard. Death Test was the first solo RPG I ever played, and it made me a fan of the genre for life. Which is good, because it took me a lifetime to solve some of the others. For example Grail Quest, which simulated the arduous and tasking search for the holy grail, did it so well that it took me over 30 years to find that damned grail. I finally solved the puzzle two years ago with my son Drew. Thanks, buddy. If you’ve heard of The Fantasy Trip recently, it’s probably because of the hugely successful Kickstarter that just funded a new set of reprints from Steve Jackson Games, the first since the game was originally published in the 80s. Metagaming’s Fantasy Trip titles are some of the most expensive microgames on the market, especially the core games Melee and Wizard, which can sell for $50 and up in mint condition. However their main catalog of games, including Chitin and Rivets, are much more reasonably priced ($10 – $15), and still a heck of a lot of fun today. I also played a lot of Task Force Games in those long ago days, especially Valkenburg Castle, one of the earliest attempts to capture the spirit and fun of dungeon-delving in a board game; the wildly popular Star Fleet Battles, the first game to really capture Star Trek fleet tactics; perennial fan favorite Starfire, the game of empire building in space, which went through six editions and spawned a fiction line; and Swordquest, a strategic-level game inspired by Tolkien. 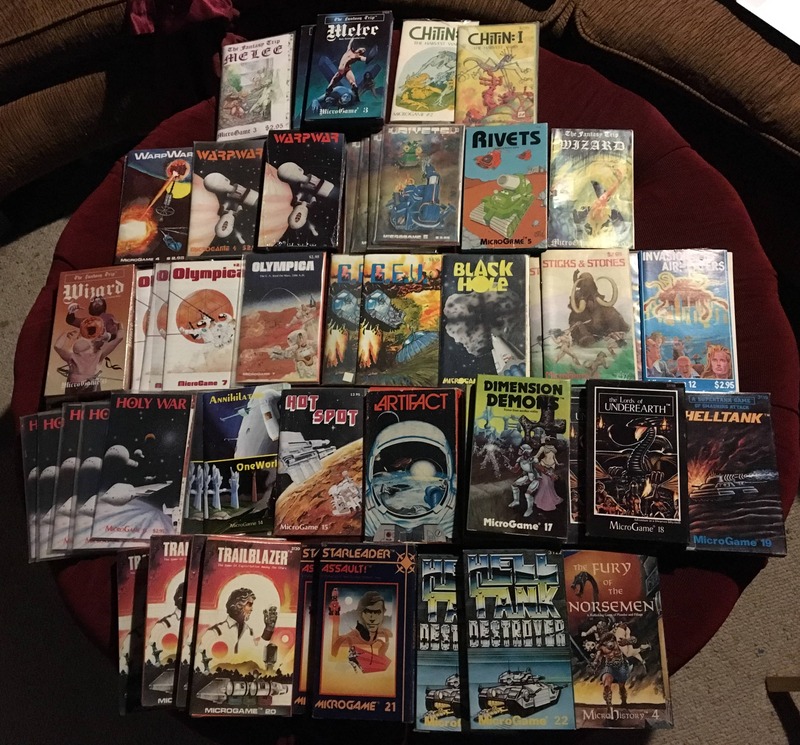 Altogether Task Force released 21 microgames, virtually all science fiction and fantasy themed. They were one of the most successful and popular publishers on the market. Most Task Force Games are available at reasonable prices in the collector’s market ($5 – $15). The exceptions are Starfire and Starfleet Battles, which still have active fans today and are much more collectible. In their heyday in the early 80s, microgames were popular enough that many of the biggest game companies jumped into the market, including SPI and TSR. 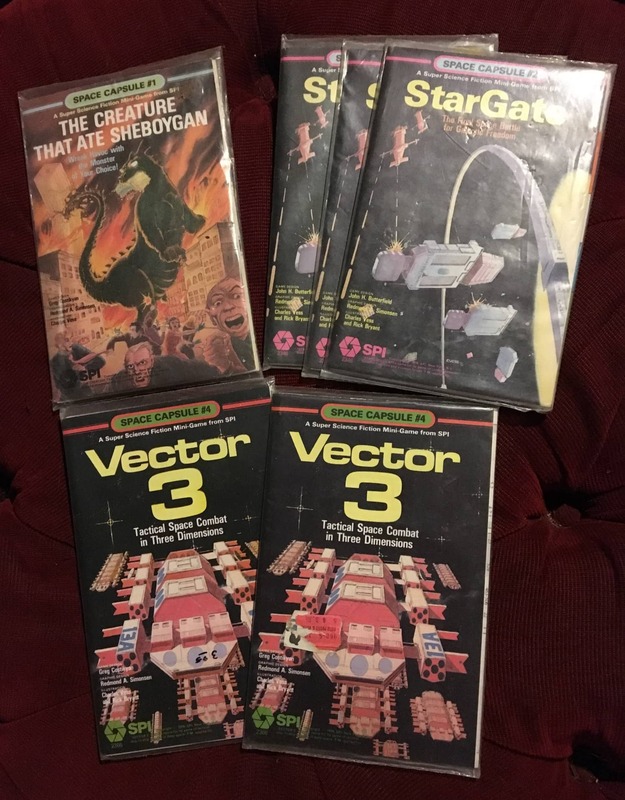 SPI published only two Magic Capsule (Demons and Greg Costikyan’s Death Maze) and four Space Capsule titles (The Creature that Ate Sheboygan, StarGate, Titan Strike, and Vector 3). 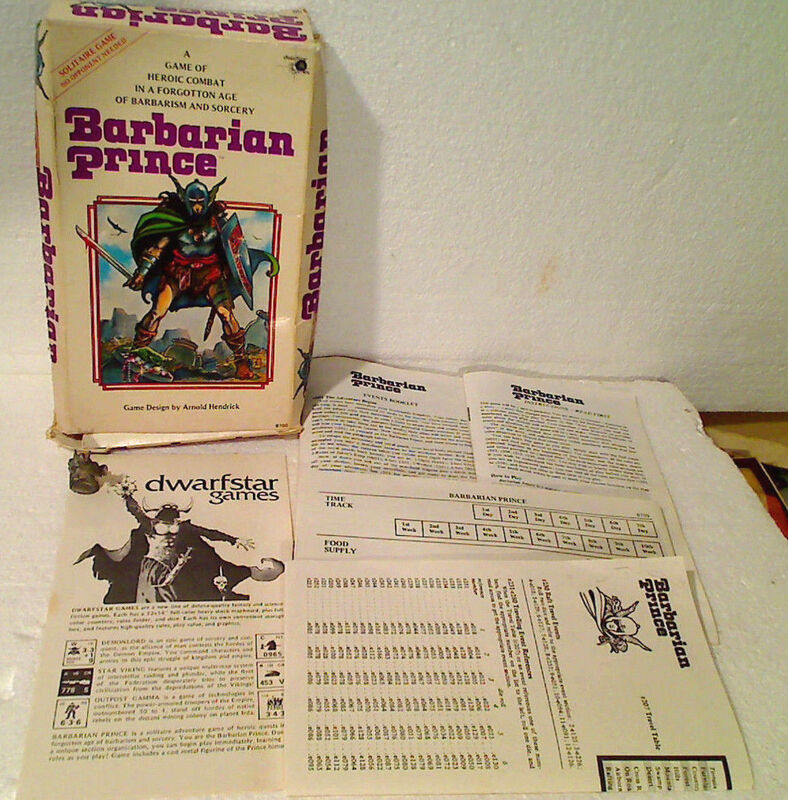 The fantasy titles were more popular, and were both eventually reprinted in box format. They’re the only ones commanding high prices today. If you’re not interested in paying a premium for microgames on the collector’s market, there are lots of good options. Sean and his son played a handmade copy of Outpost Gamma, with rules and maps downloaded from the online archive at the Dwarfstar Games website, a cheap and easy way to access most of their games. It’s a fabulous resource for anyone with an interest in microgames. There are also reprints and updated editions. Ogre, Car Wars, Starfleet Battles, Starfire, and others have been reprinted many times over the years, and the upcoming Fantasy Trip reprints promise to be a high-fidelity reproduction of the originals. 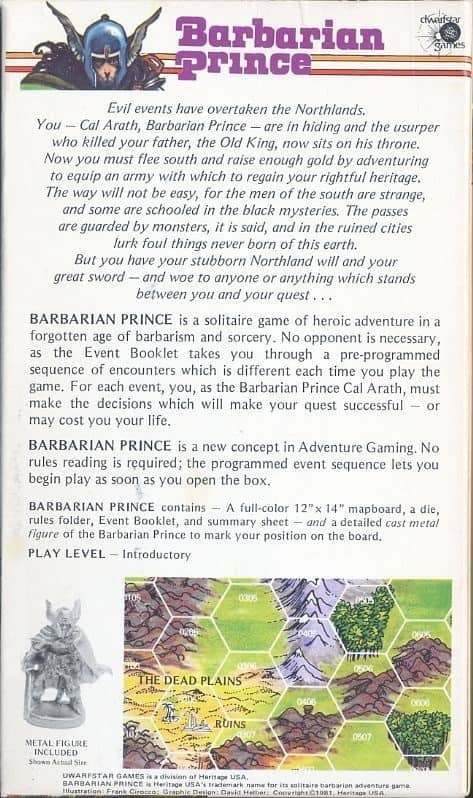 The game that interests me most though is Barbarian Prince, which has never been officially reprinted, and which remains one of the most expensive and highly collectible of all microgames. The copyright holder, Reaper Miniatures, has given permission for high-res PDF versions of the entire game to be made available at the Dwarfstar site, and fortunately there are other options as well. Barbarian Prince has been copied many times — sometimes successfully, sometimes not so much. 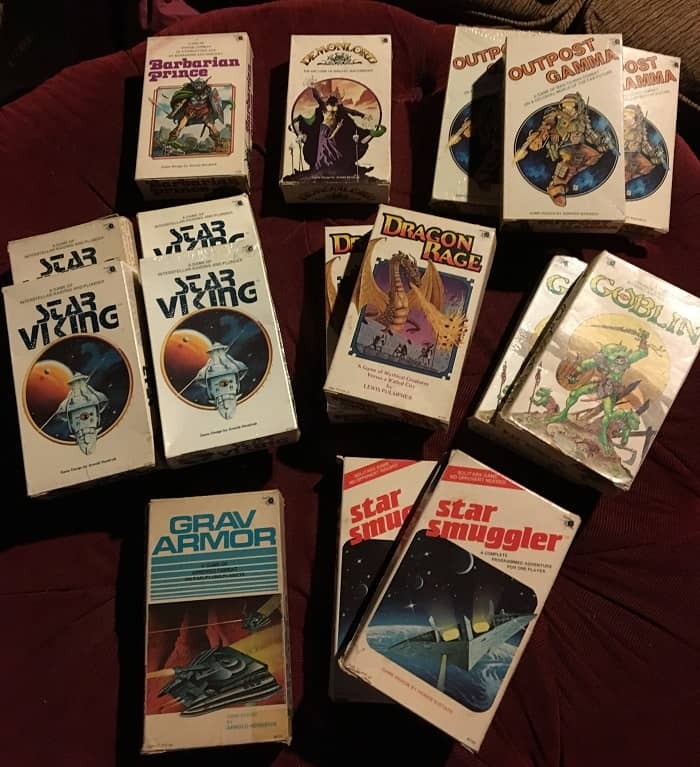 Perhaps the earliest “copy” was Dennis Sustare’s Star Smuggler, also part of the Dwarfstar line, which used the basic engine for Barbarian Prince to create an exciting science fiction variant. More recently Todd Sanders got permission to create an updated version with a new game board, pieces, and redesigned rule and event books. In his review here at Black Gate Howard Andrew Jones called it “a brilliant, beautiful, and a completely professional product.” It corrects some of the errors in the original events book, and expands the game in interesting ways. It’s available in a print-and-play format at BoardGameGeek. If you’re going to download a copy of Barbarian Prince, this is the one to get. One of the more intriguing developments is the recent appearance of solo RPGs taking direct inspiration from Barbarian Prince. 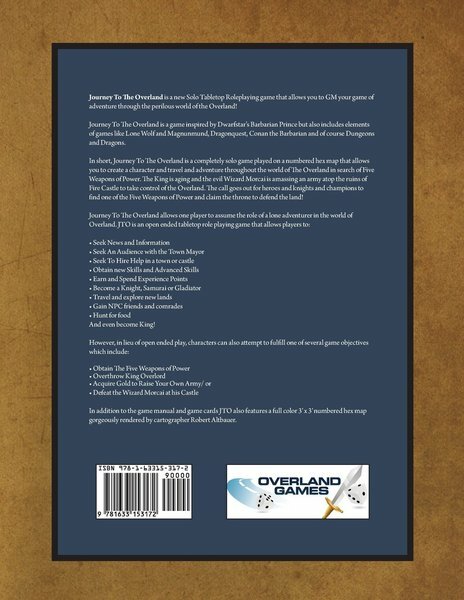 Overland Games Journey to the Overland (2015) is a huge solo RPG funded by a Kickstarter campaign. It’s vaster in scope and ambition than Barbarian Prince, and has been warmly received in the market. 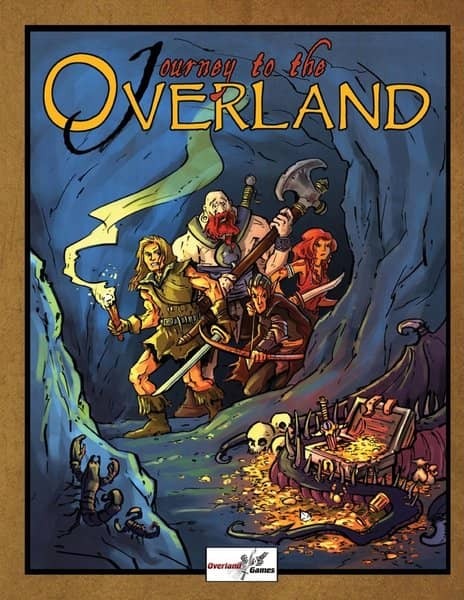 Journey To The Overland is a game inspired by Dwarfstar’s Barbarian Prince but also includes elements of games like Lone Wolf and Magnunmund, Dragonquest, Conan the Barbarian and of course Dungeons and Dragons. In short, if you liked Gloomhaven or enjoyed Legacy of Dragonholt you are going to love Journey To The Overland! In short, Journey To The Overland is a completely solo game played on a numbered hex map that allows you to create a character and travel and adventure throughout the world of The Overland in search of Five Weapons of Power. The King is aging and the evil Wizard Morcai is amassing an army atop the ruins of Fire Castle to take control of the Overland. The call goes out for heroes and knights and champions to find one of the Five Weapons of Power and claim the throne to defend the land! Designed by Deano Ware, Journey to the Overland adds event, weather and quest cards, as well as various expansions such as the Town of Misery set. Read more here. The first edition sold out fairly quickly, and a revised and expanded edition was funded in April 2018. Copies are still available for order. While the legacy of individual microgames lives on in multiple reprints and reissues, I do miss the concept of the quick and easy-to-learn mini-game. While design costs have come down over the last 40 years, paper and production costs have not. We live in a golden age of fantasy board gaming, but sadly that has not revitalized the concept of the cheap and portable microgame. One of the best resources for fans is the Classic Microgames Museum, which catalogs releases from Metagaming, Task Force, TSR, FASA, and others. For Dwarfstar fans, the best place on the web remains the website archive, with downloadable and printable copies of most of their games. And Lewis Pulsipher’s Designer Diary for Dragon Rage includes some surprising behind-the-scenes info on the collapse of Dwarfstar’s parent company, Heritage Models. Thanks for the reminder about the reworked Barbarian Prince. I’d read HAJ’s article hear but then promptly forgot about it. And thanks for letting me know about Journey to the Overland. Let’s see if I remember that long enough to acquire it. I still break out my old copy of Chitin now and then, and push the counters around…with a can of Raid by my elbow, of course. I think this is something I missed mostly, though I’d heard of Awful Green Things from Space and OGRE, etc. Great, might be looking into ebay/drivethrurpg now – not safe for Wallet – but nice article. There’s another thing might be worhty of an article due to twisted history. Well, it fizzled and ended up dying after RPGs went back a bit thanks to the UN-Moral NON-Majority’s spray of Fundamentalist Frogwash about RPGs and Satanism. BUT – a Japanese guy had picked it up on a business trip – thought it a fun game he could play with friends without the time for full RPGs. Years later he looked into it, found out it had gone plonk, managed to contact who owned it and then bought the rights. And it worked good. RPG fans in Japan LOVED playing set card games based on various fantasy female fantasies from stern warrior women to petite elf girls to large mother characters. And lots of Rule – fan art! Got so popular it got turned into some very successful anime. So an Anime the Politically Correct crowd loves to bash – though the Animes would pass the Betchel Test just FYI had its roots in a forgotten 70s/early 80s card game RPG. The Barbarian Prince figure is back in legal production from Classic Miniatures. Michael has the rights to a lot of old minis, mostly Heritage. His site is http://classicminiatures.net/ Go to his Miniatures List page, its number is max4. A lot cheaper than trying to get an original which may or may not have lead rot! Also cool to note that Dragon Rage is back in Print at the above link to Flatlined Games. Also, thanks for the shout out to Dark city Games at the end of the article! We have a few more titles in print now than we did back when that survey was done! Good to see a classic table top rpg game article from John again. I downloaded the revised Barbarian Prince and printed it out. I played it, but died almost immediately. Some rainy day, I’m going to get it out and try again. > read HAJ’s article hear but then promptly forgot about it. It’s well worth a look. Howard was kind enough to send me a beautiful printed copy (with a handmade box and everything), and I treasure it. > And thanks for letting me know about Journey to the Overland. > Let’s see if I remember that long enough to acquire it. It’s tricky to get a copy! It’s sold out on Amazon, and eBay has no copies. Looks like there’s a revised edition on the way (or possibly already delivered? ); I’ll keep my eye out for that one. 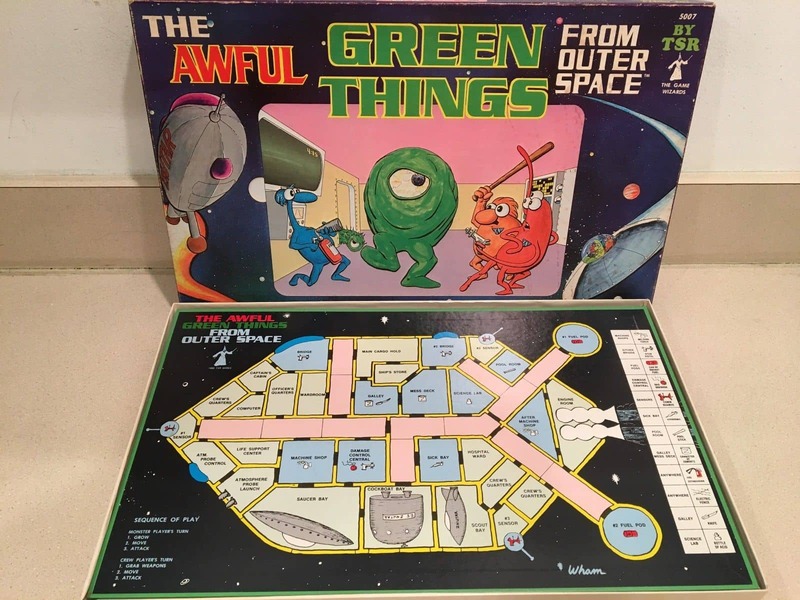 Awful Green Things has a long and storied history. It first appeared in 1979 in Dragon magazine #28 (the expansion appeared in #40), and was reprinted in a boxed format by TSR. That one’s a hard find! Here’s a look at the interior. 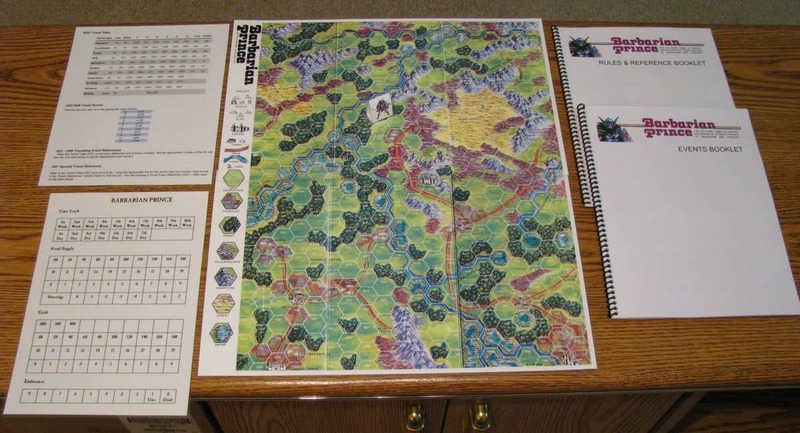 TSR had a much better reprint in 1980, with a superior map. More recently it’s been reprinted (several times) by Steve Jackson Games. They usually have high quality components, but this one looks like a paper map. Was this the one you played? > with a can of Raid by my elbow, of course. It’s been a while since I’ve played. I’m still disappointed there was never a Chitin 2! It was such an ambitious project; pity it never came to fruition. > The Barbarian Prince figure is back in legal production from Classic Miniatures. !! Wow, that’s great news. Thanks for the link! And yeah, that’s a much cheaper way to get a replacement. You’re most welcome. And yeah, that survey is over a decade old now…. definitely time to update it with your latest games! Awful Green Things! I don’t think I ever played a round of that to completion. It was like the warm-up act if anybody arrived early for the weekly RPG session when I was in college. I don’t remember which version our GM’s roommate had. Great article! Thanks for bringing back lots of memories. I had to go look for my copy of Barbarian Prince, which I found right away, but I’m missing the miniature. I’m sure I still have it, but probably just put it in with several hundred others. Finding it now could be a challenge! And remind me to show you the original Charles Vess art for Demonlord when you’re over next time! > Good to see a classic table top rpg game article from John again. Glad you enjoyed it. I definitely need to get back into the habit of doing regular game reviews. I had intended to review most of the early Metagaming games, for example, but I lost track after three articles! > I downloaded the revised Barbarian Prince and printed it out. I played it, but died almost immediately. Yeah, that’s BARBARIAN PRINCE all right. > the warm-up act if anybody arrived early for the weekly RPG session when I was in college. Sounds like a great way to play that game. It’s definitely not meant to be taken seriously! > And remind me to show you the original Charles Vess art for Demonlord when you’re over next time!